When the days get colder and darker, it becomes aven cosier at home. While the inline skates rest, we dive into memories of an exciting skating season with lost of emotional and sportive highlights. We would like to express our thanks to the thousands of partiticipants from all over the world, who help us create unique events with their endless enthuasiasm. We are already looking forward to seeing you all again in 2019. 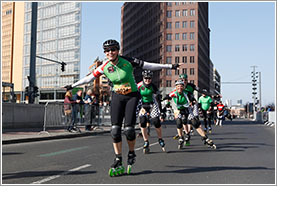 Since once again, next year, three exciting inline skating events await you, with the BMW BERLIN-MARATHON as grand finale. Take good care and enjoy the holidays. See you in spring! 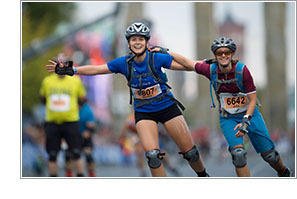 Whether you bring along your friend or colleague – it is more fun to skate the BMW BERLIN-MARATHON together. So our motto for 2019 remains: Register together and save! Marathon newbies only pay 38,- Euros if they are recruited by someone paying the full registration fee. 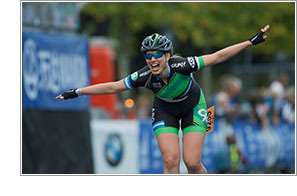 The only requirement: the newbie cannot have participated in the BMW BERLIN-MARATHON Inline Skating event previously. It is that easy! What could be nicer than lacing up the inline skates after a long and bitter winter? Accompanied by the first warming sunbeams, around 1,500 leisure skaters and professionals will start the new inline season together on April 7, 2019. So let's get rolling! Even after the winter break, the half marathon distance is something everyone can achieve. And for those who are already in great shape, time to pursue a new best time. 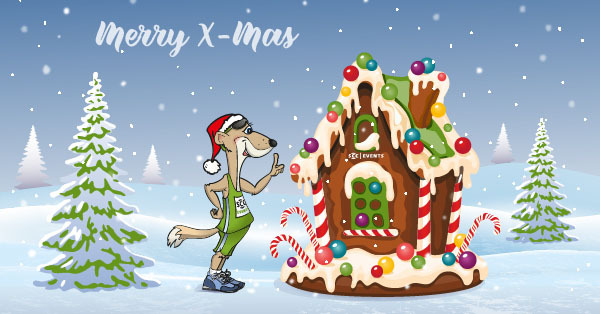 Click here to register 2019 GENERALI BERLIN HALF MARATHON Inline Skating. Once again in 2019, we are offering a triple portion of inline skating at an attractive package price: for just 119 Euros you can participate in all of the SCC EVENTS’ inline races and save up to 47 Euros over booking individually. 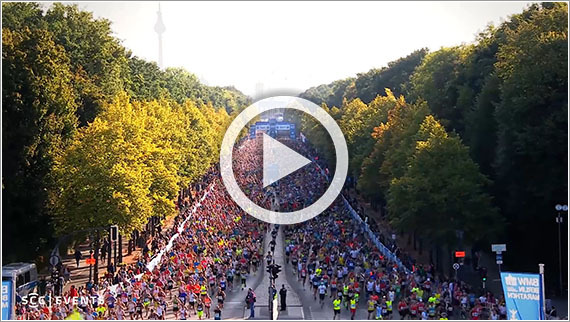 The GENERALI BERLIN HALF MARATHON, the adidas Runners City Night and the BMW BERLIN-MARATHON – three chances to experience the excitement at the start, three sightseeing tours on wheels, and triple the most amazing thrill as you cross the finish. Please note: You cannot add the season package deal to a previous registration. Registration deadline is March 15, 2019. Register here.